A leading transport company based in Perth, Reef Group provides safe, reliable and professional transportation services for clients across Australia. With a team of experienced drivers and ongoing investments in our vehicle fleet, including highly versatile side loader trucks, we’re able to provide the full spectrum of transportation services to clients in a broad range of industries and sectors. When sourcing dependable side loader transport in Perth, Reef Group is the obvious choice as our side loader fleet is modern, extremely well-maintained and more than capable of meeting your transportation requirements. Our side loaders carry 20ft and 40ft containers, including standard shipping containers and containerized generators, up to 30t in weight. Equipped with crane arms to load and unload freight from the driver’s side, they require a clearance of 6m (width) 16m (length) and 4.5m (height). Despite the required clearance space, our side loaders are extremely versatile. Why Choose Reef Group for Your Container Transportation Needs? 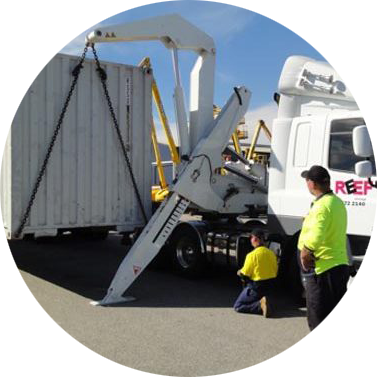 Additionally, as a 2015 ‘WA Innovator of The Year Finalist’, Reef Group is committed to delivering innovative container and equipment transportation services. That’s why we monitor and keep abreast of our clients’ needs to ensure we’re always able to cater for the specific requirements of your business. Whether this involves acquiring new plant equipment or working with one of our dependable subcontractors, you can rest assured that we have your transportation needs covered. As highly adaptable container transportation trucks, the advantages of using side loaders are profuse, making them an excellent choice whenever you need cost-effective, reliable transportation delivered by a transport company in Perth. Here are five reasons why you should choose side loader transport when transporting shipping containers and containerized equipment and generators. * Containers can be transferred to/from the ground, other containers, trucks, trains, etc. Furthermore, as side loaders are extremely accurate and enable 20ft and 40ft containers to be loaded and unloaded to/from the ground and don’t require additional equipment or machinery, they help to reduce the very real risk of injury to workers in the immediate area. That’s a great reason for using side loader transport in Perth whenever your business needs shipping containers or containerized equipment transported to worksites, ports, railway stations and other logistics hubs. 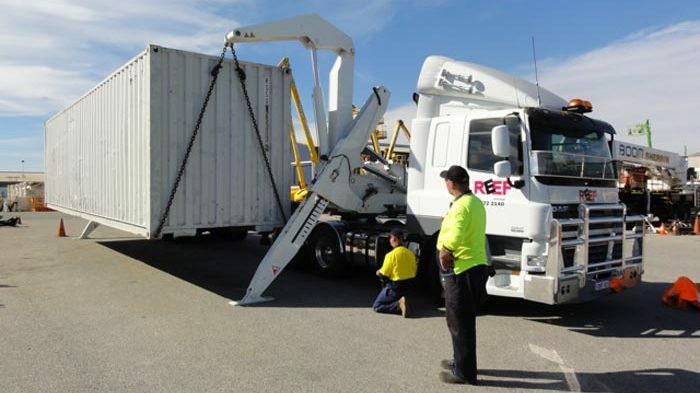 Delivering shipping containers on-time is just a small part of what we do here at Reef Group as we pride ourselves on delivering the excellent customer experiences that have cemented our strong reputation as the foremost transport company in Perth. To ensure a professional and hassle-free experience when arranging reliable and safe side loader transport, our experienced customer service team is always on hand to answer any questions and take your reservation. To reserve a side loader right now, please contact Reef Group by calling (08) 9454 3725 or submitting an enquiy through our contact form.